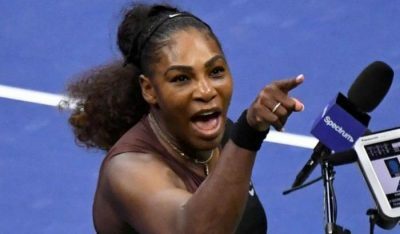 Williams, 37, was given a first code violation after umpire Carlos Ramos judged her coach Patrick Mouratoglou to be coaching — something that is prohibited under Grand Slam rules — as he watched the match courtside. When the game finished, she called the experienced official “a liar” and “a thief”. That led to Ramos docking her the next game — leaving Osaka needing just one for victory.